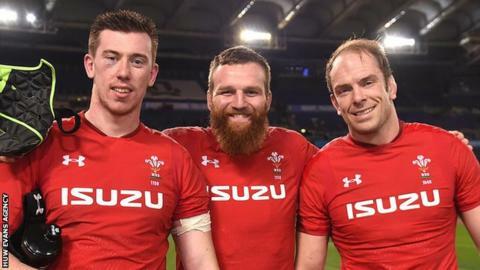 Grand Slam-chasing Wales have recalled Ospreys lock Adam Beard in the only change to their starting team to face Scotland in the Six Nations. The change for Saturday's game was enforced by the ankle injury suffered by try-scorer Cory Hill of Dragons as Wales beat England in their last match. Scarlets' Jake Ball takes over on the bench from Beard in the only other alteration to the matchday squad. Gareth Anscombe continues at fly-half with Dan Biggar again on the bench. Coach Warren Gatland resisted the temptation to recall Scarlets full-back Leigh Halfpenny to his squad following the player's successful recovery from concussion. Blues' Anscombe will win his 25th Wales cap with half-back partner Gareth Davies making a 40th appearance for Wales. A win against Scotland at Murrayfield would give Wales the chance to go for the Grand Slam a week later when they host Ireland in Cardiff. The Wales team selection was announced two days early amid a furore over plans to merge Ospreys and Scarlets and launch a new team in north Wales for next season. That proposal affects 13 of the players that Gatland hopes can maintain their concentration on the pitch instead of off-field developments which he claimed the regions were driving. "That's why we had [WRU chief executive] Martyn Phillips down here yesterday addressing the players. "Just trying to put them at ease in terms of what is going on. "This hasn't been driven by the Union. The Union was approached by two of the regions about a consideration about a possible merger. It is a decision for the PRB. Although he is concentrating on Wales' Six Nations trip to Scotland, Gatland would welcome a region in north Wales. "My hopes for Wales is that something can be sorted," added the New Zealander, who steps down as Wales coach after the 2019 World Cup. "If a team does end up in north Wales, it's going to be challenging for players that may potentially go up there or be asked to go up there. "From a Welsh perspective, I see it as a massive positive. There are a million people in north Wales and a lot of businesses up there, and if we can promote the game in north Wales, I see it long-term as a real benefit. "We have probably hampered ourselves in the past by the proximity of some of our regions and them vying for the same fans and sponsors. "We are all aware that our crowds aren't big enough, and the crowds need to be bigger to help promote the game and to fund the game, so a team in north Wales might long-term be a positive outcome for Welsh rugby. "In saying that, our focus is on Saturday, and then on Ireland the following week and trying to win a Six Nations title." Wales defeated France and Italy away then won against England in Cardiff to set a 12-match winning run record for their national team. Gatland has not lost in any of the 10 Wales games he has coached against Scotland. Wales team to face Scotland: Williams (Saracens), North (Ospreys), J Davies (Scarlets), Parkes (Scarlets), Adams (Worcester); Anscombe (Cardiff Blues), Davies (Scarlets); Evans (Scarlets), Owens (Scarlets), Francis (Exeter Chiefs), Beard (Ospreys), Jones (Ospreys, capt), Navidi (Cardiff Blues), Tipuric (Ospreys), Moriarty (Dragons).